“Kanga Products (UK) provided the first Open QRP 40m transceiver kits at the UK National Hamfest on 27/28th September. The kit is priced at £89 (GBP) and has an LCD display and front panel controls for Tune, RIT, RF Gain, and 6 push buttons. Output is 6 to 8 Watts at 13.5 V. [T]he Open QRP transceiver also includes a separate chip that decodes incoming CW and CW sent via paddles! The transceiver was designed by Steve Elliott, K1EL, of WinKeyer fame. I was fortunate to be able to purchase one of the kits at the Hamfest. Although I haven’t yet had time to put it together, one purchaser already has his transceiver up & running. This is an exciting product for us in the UK, as normally items like this are imported from the USA, suffering high tax and import charges. It begs comparison with Ten-Tec’s Model 506 Open Source QRP CW Transceiver, which is more or less the same concept based on Arduino technology (probably the Rebel was inspired by K1EL’s design, which he started in 2009). The Open QRP is single band and a kit, whereas the Rebel has two bands and is ready-built. The Open QRP has an LCD display and 6 push buttons, where as the Rebel has no display and two push buttons. Many thanks for the info, Graham! 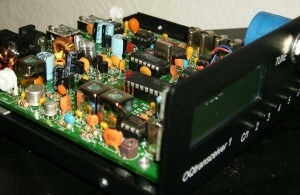 Please let us know about your experience building and getting the OpenQRP transceiver on the air! This entry was posted in Kits, News, Product Announcements, QRP Radios and tagged Graham Smith G3ZOD, Kanga Products, Kits, Open Source, Open Source QRP, OpenQRP Transceiver, QRP, Transceivers. Bookmark the permalink.